“Welcome to Churchill. Either you’ll get it, and I won’t have to explain it to you. Or you don’t get it, and I’m not going to bother explaining it to you.” Our Lazy Bear Expeditions guide Jason – a goateed, sun/wind-kissed wildlife photographer – is an affable straight shooter who sets our expectation about visiting this tiny sub-Arctic town. We’ve just touched down, a group of 14 Americans (including a family of five from Iowa), four Brits, four from southern Ontario, and me, the lone Manitoban. We don’t know each other (yet), but we share the giddy excitement of what these next four days will bring. Churchill has a mystical reputation known around the world – surprising for a small rural town isolated on the shore of Hudson Bay, nearly 1,000 kms removed from Manitoba’s populated south. My comrades are the adventurous types who have travelled to Borneo to see the orangutans, trekked Patagonia, and cruised to Antarctica. I am bursting with pride that my humble home province ranks right up there among those exotic locales. Bucket List. Transformative. Life changing. Aha moment. Whatever word you use to describe travel, Churchill leaves an impression. And Jason’s ‘show, don’t tell’ philosophy proved true. Each day of our ultimate arctic summer adventure, Lazy Bear Expeditions delivered mind-blowing moments. The rustic aesthetic of our log cabin home is exactly what I envisioned while staying in a northern frontier town. Hand built by founder and long-time resident Wally Daudrich in the 90s (and run by a tight network of expert staff), Lazy Bear Lodge has a very familial vibe, a down-home quality that Manitoba is known for. My favourite part of being at the lodge was bonding with other travellers, whether it was in the morning over a cappuccino in the cafe, or after a wind-swept water tour swapping stories and photos in the fireside lounge. Wildlife reputation aside, Churchill in the summer captivated me with its wondrous landscape, hypnotizing light, and striking colour palette. 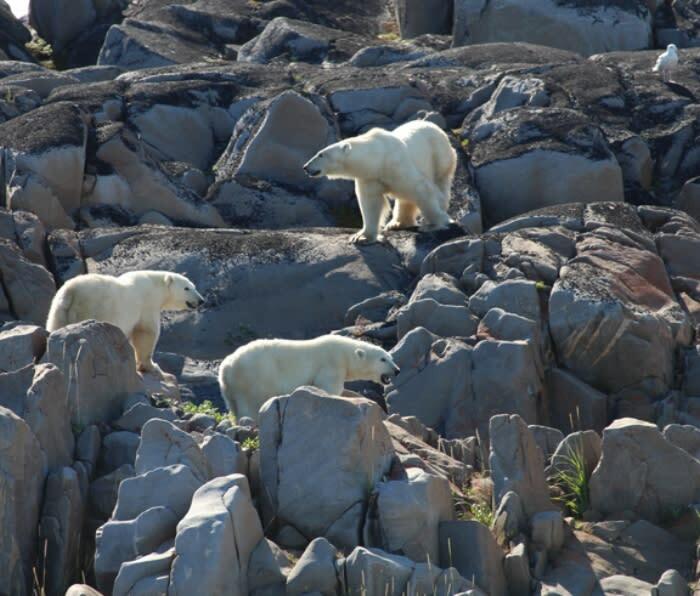 Lazy Bear Expedition’s town and area tour is key in learning the geographical secret of the town’s allure: It’s at the convergence of three ecozones, where the boreal forest (taiga), meets the tundra and the marine life of the Hudson Bay. During my August visit, the wildflowers were in bloom and I became obsessed photographing the fushia fireweed popping up between the greywacke rock that is decorated in fiery orange lichen. Of course, Manitoba’s legendary blue skies were a perfect backdrop. The older I get, the more I appreciate learning the stories of the land I travel to. Churchill offers some of the most alluring Canadian history, and Lazy Bear Expeditions makes sure you learn it by taking guests on a stand-out boat tour across the Churchill River to Prince of Wales Fort, a Parks Canada National Historic Site. We were greeted by Samuel Hearne, an 18th century British explorer and naturalist who was infamous around these parts. Hearne yarns amusing first-person tales about living in a northern fur trade fort, but more important is he puts Churchill’s past and present identity into context. 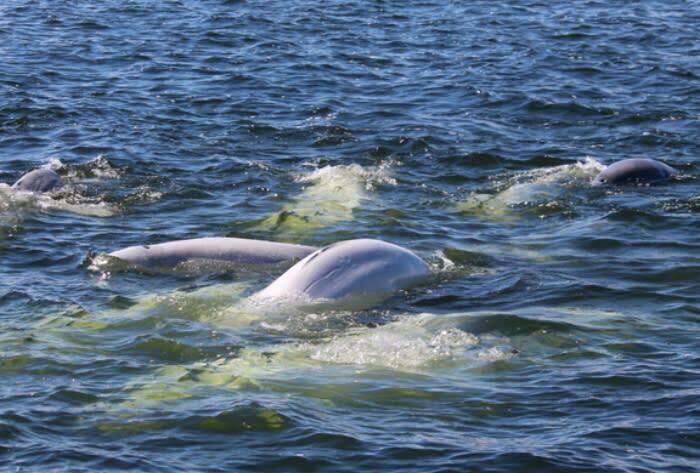 Getting out on the water is a must-do in Churchill to get friendly with the thousands of the white mammals who enter the northern river estuaries in summer to feed and give birth. A Zodiac tour of the Churchill River had me wishing my neck could rotate 360 degrees to catch all the views of surfacing whales. The action was endless, and if I didn’t see them, I at least heard all their exhalations as they broke the surface. Another day we boarded Lazy Bear’s customized vessel, the Sam Hearne, for a day trip up the Hudson Bay (and technically into the waters of Nunavut, Captain Wally points out). The belugas got more plentiful in the bay – pods of handsome male bulls mixed with young moms distinguishable by the little gray calves at their side. The boat’s gate dropped down, allowing us to inch forward on our bellies to get nearly water level with the frolicking whales. As midday approached, we pulled out our lunches and dined with the belugas, who were clearly have a feeding frenzy of their own on some fish in the water. Upwards to 58,000 belugas whales enter the western Hudson Bay and northern river estuaries each July to feed on capelin. A female polar bear with two, eight-month-old cubs hanging out along the Hudson Bay shore near Churchill. Our coastal tour aboard the Sam Hearne vessel answered the question that everyone was wondering, “When will we see a polar bear?” Summer is not peak season for bear viewing; normally the bears, fresh off the melted ice after seven months of hunting seals, are dozy and keep a low profile. But within minutes of entering the bay, our guides spotted a gorgeous back-lit mama bear sunning herself on the rocks. As we coasted to shore for a closer look, two cubs popped up from behind boulders. We idled in awe watching their every move, snapping pictures, asking questions, and learning polar bear biology. After 10 minutes, we politely parted ways and continued on to our beluga whale lunch date (read #3). A few hours later, on our return trip back to Churchill, we decided to scout the shoreline to see if we could spot the three bears again. We found them just coming out of the water and scampering towards something white on shore. The bears had discovered a beluga carcass washed up on shore (likely killed by a Inuit hunter judging by the cut marks, notes Captain Wally). Mama and her cubs had a blubbery feast, a rare treat in summer when normally polar bears fast. Suddenly, it was like we were in an episode straight out of Wild Planet; our day’s wildlife experiences of viewing bears and belugas in their natural habitat came full circle. It was nature at its rawest…and it was awesome.